The American Civil War (1861-1865) witnessed a technological revolution in weaponry, and this was highlighted by the evolution from smoothbore firearms that had to be loaded through the muzzle each time a shot was fired to rifled-barrel firearms, some of which loaded at the breech. Most of these new rifle-muskets still had to be loaded between each shot, but repeating weapons such as 7-shot Spencer and 16-shot Henry rifles and carbines were developed as well. Unfortunately for the common soldier, tactics did not advance as quickly as weapons technology. Napoleonic linear tactics from earlier in the century were now combined with more accurate, greater distance, faster-firing weapons resulting in catastrophic casualty figures throughout the Civil War. The primary cause of battle deaths and wounds was from the firearm known as the small arm. 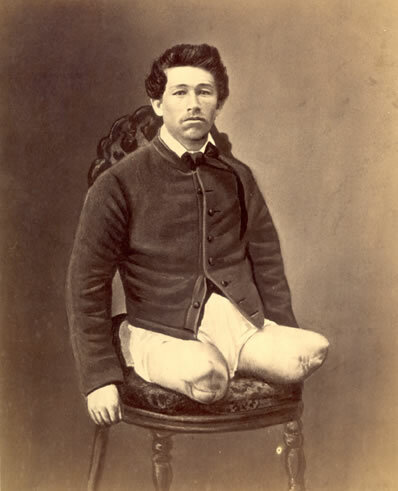 Although one in four Civil War soldiers never returned home, one in thirteen soldiers became an amputee. Even though amputation was the wounded soldier's best friend, one in four amputees died principally as a result of gangrene. 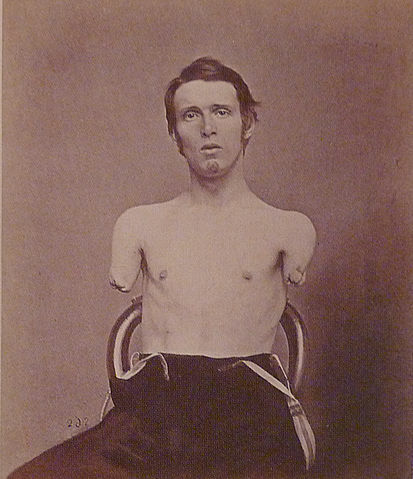 While gangrene was the number one cause of death for amputees, amputation was, nevertheless, the wounded soldier's principal means of survival. Amputation had to be performed quickly, however, within 48 hours, to inhibit blood poisoning, bone infection, or gangrene. A soldier who had his forearm amputated had a survival rate of 76%, while amputation at the hip joint witnessed a survival rate of merely 12%. 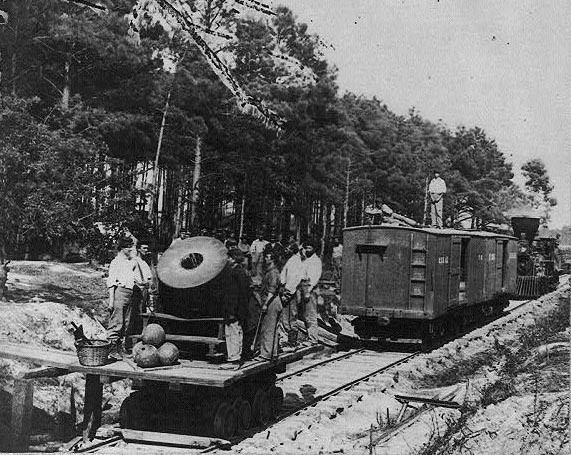 The Confederacy, whose industrial base was far weaker than the Union's when the war began, accomplished a great feat by establishing a viable arms-manufacturing capability quickly. The North's industrial machine also swung into high gear to produce huge quantities of weapons and ammunition. Agents from both the Union and the Confederacy scoured the shelves of European arms-dealers to ensure that their armies had an adequate supply of weapons. Most Confederate infantrymen favored the English-manufactured Enfield. While the Union and Confederate soldiers fought the Civil War, both sides employed a variety of weapons. These weapons included firearms such as handguns, rifled-muskets, breech loaders and repeating weapons, various field guns such as artillery, edged weapons such as knives and swords, and new weapons such as the early grenade and machine gun. The Civil War is often referred to as the first "modern" war in history because it included the most advanced technology and innovations of warfare to date. Some of the innovations and advances of the Civil War included mass production of war material, rifling of gun barrels and the use of the Minié ball, the advent of repeating firearms and metallic cartridges, ironclad warships (battleships), application of naval mines and torpedoes, first submarine to sink a vessel, advances in medicine, use of total war, employment of machine guns and hand grenades in siege and trench warfare, communication (especially the telegraph), and transportation (railroads), and the gradual decline of tactics from previous centuries. The U.S. Military Academy at West Point was the training ground for many of the leading Union and Confederate officers and generals during the Civil War. West Point, however, was teaching ancient and outdated Napoleonic Tactics for the modern weaponry and technology employed on the battlefields. The result was carnage beyond comprehension and a nation that suffered 2% of its population in killed (620,000). Presently, 2% of the U.S. population would equate to more than 6,000,000 souls. Although the four year Civil War claimed more lives than all the nation's previous wars combined, leaving the country bloodied and destitute, the nation would eventually recover and evolve into the world's superpower. 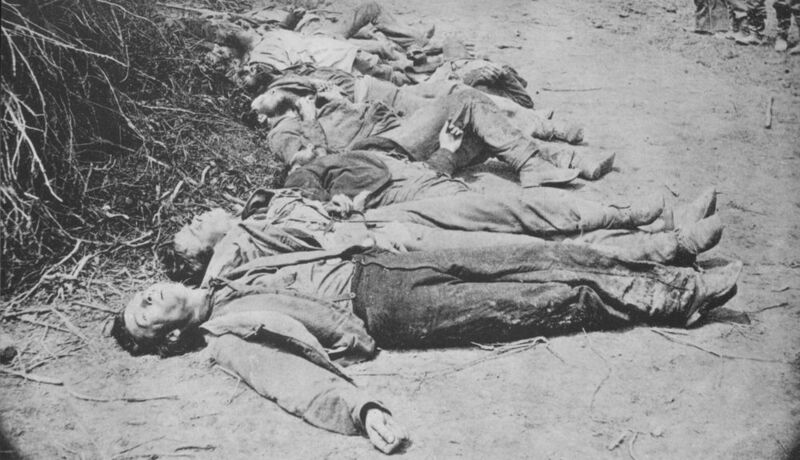 (Above) Weapons referred to as small arms and firearms killed more soldiers than all other Civil War weapons combined. 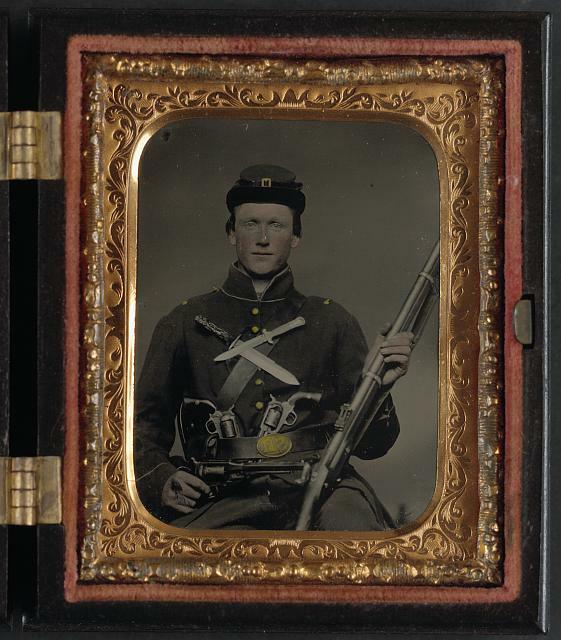 Although the Civil War witnessed the first use of photography in combat, most of the war's photos were not released immediately for circulation. While many of the photographs of the dead were not released until 40 years after the war, innumerable photos were discarded because many Americans merely wanted to put any and all thoughts of the carnage of war behind them. The war killed 2% of the total US population, 620,000 Americans, and every community was scathed in some manner. Today, many read and study the conflict from history books and websites, but at the time, they endured the unimaginable, the unthinkable, and it was personal and up close. Present-day, however, occasionally a Civil War era photo is discovered and displayed allowing more insight into the war and the art of photography. One such photo discovered was of President Abraham Lincoln in a casket. While at the Illinois State Historical Library in 1952, a 14-year old boy was reading an old book and he found an envelope tucked between the pages that contained a photograph of President Abraham Lincoln in his coffin on April 24, 1865. The discovery startled historians, because Edwin M. Stanton, Lincoln's Secretary of War, had ordered this photograph to be destroyed. Stranger yet, the only surviving print remained with Stanton, whose son preserved it. It is also believed that the majority of the Civil War photos that exist have never been circulated. Perhaps the elusive photos are between the pages of grandma's old bible on a bookshelf, and in a dust covered chest or box in the attic or storage facility, and in an old book in your community library. (Left) List of Civil War weapons and firearms: rifle, revolver, and sword. 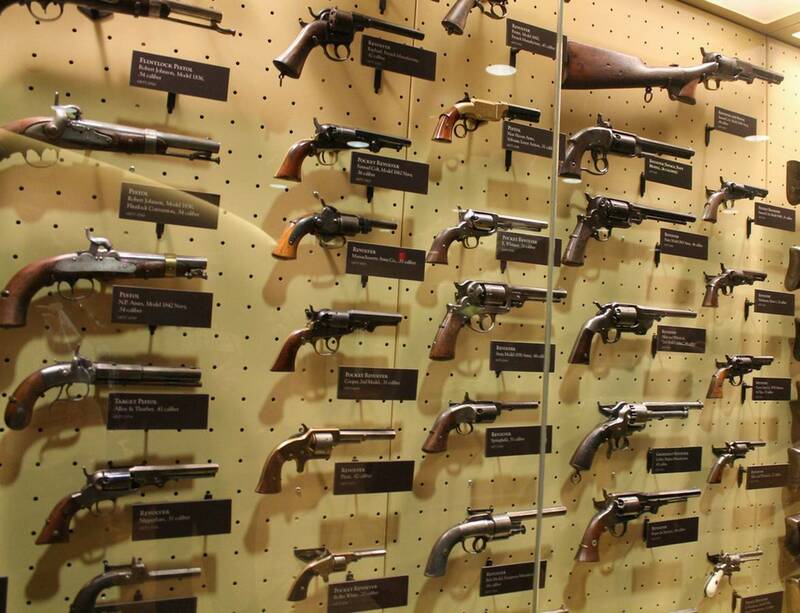 (Right) Civil War weapons and small arms: guns, pistols, and knives. 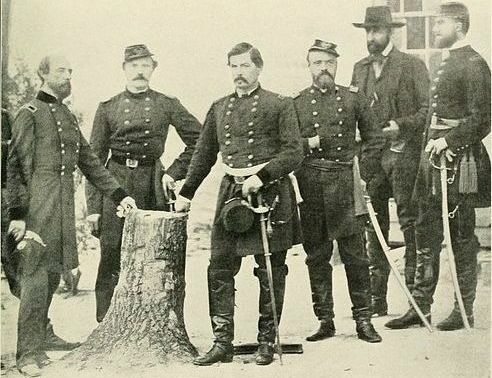 (Left) Union General George B. McClellan with staff, dignitaries, and sabers in Autumn 1861. (Right) Confederate Cavalry, with weapons, near Monroe's Crossroads in 1865. Although at the beginning of the Civil War the Regular Army was generally armed with rifled muskets, most of the combatants at Bull Run were state volunteers, armed with whatever weaponry that had been purchased by state authorities. These included various types and calibers of domestic and foreign smoothbores, some of which had only recently been converted from flintlock; and various types and calibers of rifles; and the longer rifled muskets. In 1861 a shortage of rifles on both sides forced the Northern and Southern governments to issue the older smoothbore weapons or purchase weapons from European nations. As the war progressed most soldiers eventually were armed with rifled muskets, although even late in the war some troops on both sides still carried smoothbores. During most of the war the standard infantry weapon was the .58-caliber rifled musket, adopted by the U.S. Army in 1855 to replace a .69-caliber smoothbore musket. The new infantry arm was muzzle loaded, its rifled barrel taking a hollow-based cylindroconical bullet slightly smaller than the bore. The loading procedure required the soldier to withdraw a paper cartridge (containing powder and bullet) from his cartridge box, tear open one end with his teeth, pour the powder into the muzzle, place the bullet in the muzzle, and ram it to the breech using a metal ramrod. A copper percussion cap was then placed on a hollow cone at the breech. To fire the weapon the hammer was cocked, and when the trigger was pulled the hammer struck the cap and ignited the powder charge. Each soldier was expected to be capable of loading and firing three aimed shots per minute. Although the maximum range of a rifled musket might be over 1,000 yards, actual fields of fire were often very short, the emphasis of musketry fire resting upon volume at close range rather than accuracy at long. The basic ammunition allowance for each infantry soldier was 40 rounds in a leather cartridge box. When a large action was expected, 20 additional rounds were issued to each soldier, who placed them in his uniform pockets or knapsack. In addition, 100 rounds per man were held in the brigade or division trains and 100 rounds in the corps trains. Officers generally carried both single- and multiple-shot handguns. Although the types of handguns used by both sides were innumerable, two of the most common were six-shot revolvers produced by Colt and Remington, both in .36- and .44-caliber. Union cavalrymen were initially armed with sabers and handguns, but soon added breech-loading carbines. In addition to Sharps and Spencer carbines, dozens of other types of breech-loaders, from .52- to .56-caliber, were issued. Confederate cavalrymen might be armed with a wide variety of handguns, shotguns, muzzle- loading carbines, or captured Federal weapons. Any weapon smaller than a cannon and carried by a soldier was known as a small arm. During the Civil War, small arms included muskets, which were smoothbore, long-barrelled shoulder arms; rifles, shoulder guns with spiral grooves cut into the inner surface of the barrel; carbines, short-barrelled rifles; and handguns, including pistols and revolvers. Like artillery, small arms also were designated by their caliber, mode of loading (breech or muzzle), and maker. 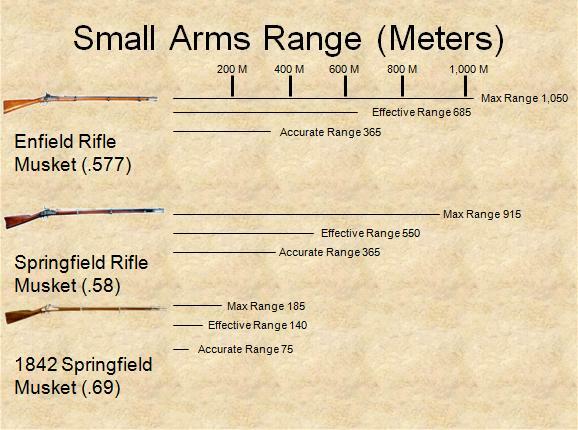 The principal small arms on both sides, muzzleloading arms that fired the deadly Minie ball, were the .58 caliber 1861 Springfield rifle-musket, .577 caliber 1853 Enfield Pattern rifle-musket, and the .69 caliber 1842 Harpers Ferry Rifle (rifling and a long range sight were added by the Springfield arsenal in the late 1850s). The introduction of these rifled pieces would compel a radical change in infantry tactics, which had been based on the use of the shorter range, less accurate smoothbore muskets. Using smoothbores, firing lines at more than 100 yards apart could not inflict massive casualties. For an attack to be successful, soldiers were forced to mass and fire volleys, advance, mass and discharge the weapons, and then charge with fixed bayonets directly into the enemy. The Civil War rifled musket, with its greater accuracy and longer range, was able to kill at an effective range of 400 yards, making a direct, frontal assault a particularly deadly affair. Trained soldiers were able to fire at a rate of three aimed shots per minute while maintaining accuracy to 400 yards, though firing distances in the war were often much shorter. One of the greatest small arms controversies during the war involved the debate over breechloaders and muzzle-loaders. Because breechloaders were able to fire more rapidly, they created a need for more ammunition, which neither army had in great supply. Breech-loaders were used primarily by the cavalry: one of the most effective was the recently-invented Spencer carbine. The Spencer carbine, which held seven .52 caliber cartridges, was easy to use and lightweight. Other important shoulder arms included the Henry repeating rifle, which carried 15 rounds of .44 caliber cartridges in its magazine, and the Sharps carbine. 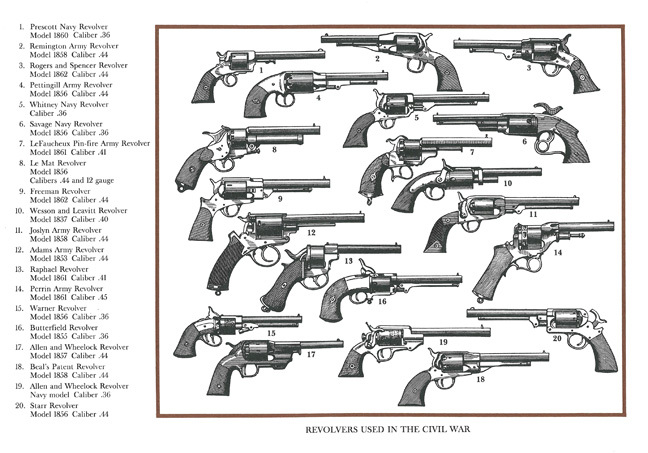 Hundreds of thousands of revolvers of different makes and models were used by Confederate and Union soldiers. By far, the most common was the Colt revolver, primarily the .44 caliber Model 1860 and the .36 caliber Model 1851 Navy, both of which were lightweight (less than three pounds). The Remington New Model and the Starr Army Percussion revolvers were also purchased in large numbers by both sides. As in artillery, the North enjoyed an overwhelming advantage over the South in small arms. For most of the war, the Confederacy depended on imports smuggled through the increasingly effective naval blockade. Several different foreign models, particularly from France and England, were imported by the Confederate army, and some were made famous by the generals who employed them. The limited production French LeMat revolver, for instance, was favored by Confederate generals JEB Stuart and P. G. T. Beauregard. Developed by a French-born New Orleans physician, the .44 caliber was produced in France when the Confederates could no longer supply the machinery or metal at home. The English Enfield rifle, which fired a .577 caliber shot, was another appreciated import, with approximately 900,000 used by Confederates during the war. See also Civil War Weapons, Firearms and Small Arms. The U.S. Model 1842 Springfield was a .69 caliber musket used mainly at the onset of the Civil War, and was a continuation of the Model 1816 line of muskets but was generally referred to as its own model number rather than just a variant of the M1816. Manufactured by Harpers Ferry and Springfield armories from 1844-1855, with approximately 275,000 produced (Harpers Ferry Armory 103,000; Springfield Armory 172,000), the Model 1842 was the last U.S. smoothbore musket, but the first regulation musket in the percussion ignition system manufactured at the national armories. Both Harpers Ferry and Springfield had fully interchangeable parts, and only a fraction of these weapons were modified with the .69 caliber rifled barrel and utilized on the battlefield. Many features that had been retrofitted into the Model 1840 were standard on the Model 1842. The M1842 was the first U.S. musket to be produced with a percussion lock, though most of the M1840 flintlocks were converted to percussion locks before reaching the field. The percussion cap system was vastly superior to the flintlock, being much more reliable and resistant to weather. Like all Model 1816 derivatives, the M1842 was a .69 caliber with a 42" barrel length, an overall length of 58 inches, and a weight of 10 lbs. A great emphasis was placed on manufacturing processes for the Model 1842. It was the first small arm produced in the U.S. with fully interchangeable (machine-made) parts. Although approximately 275,000 Model 1842 muskets were produced at the Springfield and Harper's Ferry armories between 1844 and 1855, the musket was also produced by private contractors, though few in number. Some were made by A.H. Waters and B. Flagg & Co, both of Millbury, Massachusetts. These were distinguished by having brass furniture instead of iron. A.H. Waters went out of business due to a dearth of contracts in New England, and Flagg entered into a partnership with William Glaze of South Carolina. They relocated the machinery to the Palmetto Armory in Columbia, the state's capital. Instead of “V” over “P” over the eagle’s head, these guns were usually stamped “P” over “V” over the palmetto tree. 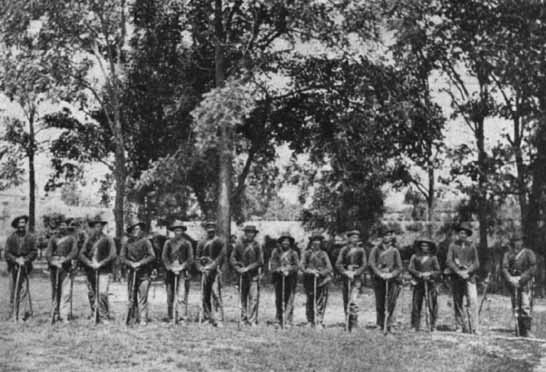 Most of the output of the Palmetto Armory went to the state militia of South Carolina. There were only 6,020 1842 type muskets produced on that contract through 1853. Like the earlier Model 1840, the M1842 was produced with an intentionally thicker barrel than necessary, with the assumption that it would later be rifled. As the designers anticipated, many of the 1842 muskets had their barrels rifled so that they could fire the newly developed Minié ball. Tests conducted by the U.S. Army indicated that the .69 caliber musket was not as accurate as the smaller bore rifled muskets. Also, the Minie ball, being conical and elongated, had much more mass than a round ball of the same caliber. A smaller caliber Minié ball could be used to provide as much mass on target as the larger .69 caliber round ball. For these reasons, the Model 1842 was the last .69 caliber musket. The Army later standardized on the .58 caliber Minie ball, as used in the Springfield models of 1855 and 1861. Both the original smoothbore version and the modified rifled version of the Model 1842 were used in the Civil War. The smoothbore model was produced without sights, as they provided little value to a weapon that was only accurate to about 50 to 75 yards. When Model 1842 muskets were modified to have rifled barrels, sights were usually added at the same time as the rifling. See also Civil War Weapons, Small Arms, Firearms, and Edged Weapons: A Photographic History. 1) The Springfield Model 1861 (also known as Model 1861 U.S. rifle-musket) was a .58 caliber Minié-type rifled musket shoulder-arm used by the Union Army and marines during the Civil War. Known as the "Springfield," after its place of production, Springfield, Massachusetts, it was the most widely used Union Army weapon during the conflict and it was favored for its range, accuracy, and reliability. Union total, including variants, was more than 1,000,000. Some variants of the Springfield, however, were also appreciated by the Union soldier, such as the 1863 Springfield rifled-musket, allowing the Springfield to remain the weapon of choice. The Springfield was aimed using flip-up leaf sights. The sight had two leaves, one for 300 yards and the other for 500 yards, and with both leaves down, the sight was set for a range of 100 yards. By contrast, the British Pattern 1853 Enfield, favored by the Confederates, utilized a ladder-sight system with 100 yard increments, using steps from 100 to 400 yards and a flip up ladder for ranges beyond 500 yards. While the Enfield's sights did allow finer range settings, the Springfield's simple leaves were more rugged and were less expensive to produce. The Enfield's sights extended to 900 yards (and further, on later models), compared to the 500 yard maximum range of the Springfield's sights. 2) The Enfield Pattern 1853 rifle-musket (aka Pattern 1853 Enfield, P53 Enfield, and Enfield rifle-musket) was a .577 caliber Minié-type muzzle-loading rifle-musket, used by the British Empire from 1853 to 1867. The Enfield 1853 rifle-musket was also used by both the North and the South in the Civil War, and was the second most widely used infantry weapon in the war, surpassed only by the Springfield Model 1861 rifled-musket. For Confederate forces, the Pattern 1853 had the ability to use the Union Springfield rifle ammunition and its own .577 caliber type, allowing its soldiers to use captured Union ammunition as well as their own issued supply. Since the South held little in the way of heavy industry, this feature proved a key logistical benefit. The Confederates imported more Enfields during the course of the war than any other small arm, buying from private contractors to gun runners. It has been estimated that more than 900,000 P53 Enfields were imported to the United States and saw service in every major engagement from the Battle of Shiloh (April, 1862) to the Siege of Vicksburg (May 1863) to the final battles of 1865. The gun was highly sought after in the Confederate ranks. According to British officials during the early stages of war, nearly 70% of the Confederate soldiers were armed with smoothbore weapons, such as the Model 1842 Springfield, among others. Later in the conflict, the British stated that more than 75% of the Confederate forces had attained a rifle, with the majority armed with the prized Pattern 1853 Enfield. The development of this half-inch lead rifle bullet revolutionized warfare, while the slowness of Civil War military leaders to adapt their tactics to adjust to the new technology was greatly responsible for the overwhelming number of battlefield deaths. Before the introduction of what soldiers commonly referred to as the "minnie ball"--even though it was indeed bullet-shaped--the use of rifles in battle was impractical and largely limited to corps of elite marksmen. Expensive, tight fitting projectiles had to be jammed into the grooves of the rifle's muzzle, a time-consuming process. In 1848, however, French Army Captain Claude F. Minie created a smaller, hollow-based bullet that could quickly and easily be rammed into the bore. Expanding when the weapon was fired, the Minie spiraled through the rifling and exited the barrel. That spin made the Minie ball, like other, more expensive and unwieldy rifle bullets, a highly precise and far traveling projectile. Although it could traverse more than 800 yards, the average soldier could easily hit a target, known as effective range, 250 yards away. By 1855, Harpers Ferry Armory worker James H. Burton had honed an even cheaper version of the Minie ball, which, along with the rifle itself, soon became widely used in the U.S. Army. It was the standard bullet for both sides in the Civil War, although neither anticipated the enormous difference this would make on the battlefield. Against a defensive line using musket fire-requiring a 25-second reloading period and accurate to only 100 feet or less--a frontal infantry charge was likely to be successful if the assaulting force advanced quickly enough. See also Civil War Weapons and Small Arms. The widespread use of the Minie bullet, however, shifted the balance greatly to the defense's favor. 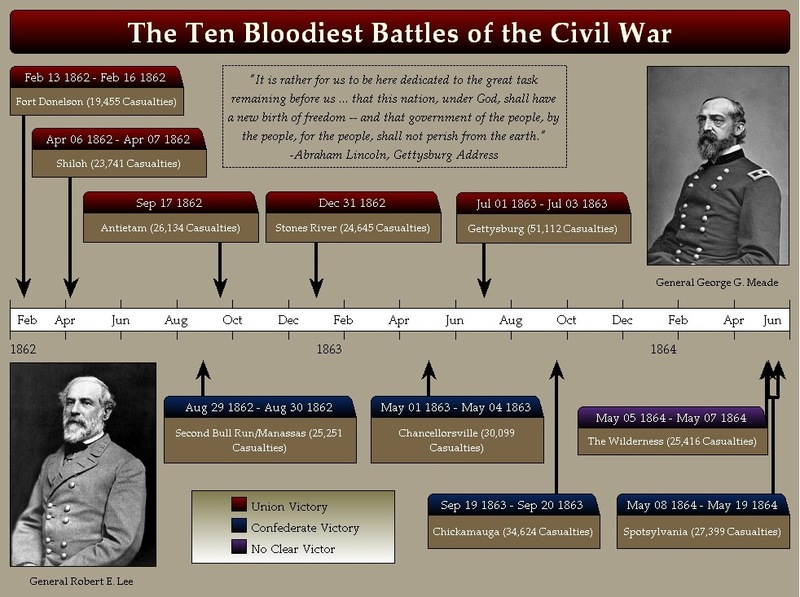 Nevertheless, Civil War generals continued ordering such attacks, learning only after hard and bloody battlefield experience--from the assault on Marye's Heights at Fredericksburg to Pickett's Charge at Gettysburg--that their strategy would have to be altered. See also The American Civil War Soldier and Firearms. Bayonets, sabers, swords, short swords, cutlasses, Bowie knives, pikes, and lances, classified as "edged weapons," appeared in considerable profusion during the Civil War. Although they served to decorate their original possessors and delight modern collectors, they inflicted few casualties. Bayonets were detachable blades put on the muzzle ends of muskets and rifles, for use in hand-to-hand fighting. Most bayonets were angular (or socket) bayonets. The three steel and/or iron parts of an angular bayonet were the blade, socket and clasp. The blade had a sharp point and usually three fluted sides The socket fit tightly over the outside of the muzzle and was secured to a stud on the barrel by the clasp. Generally, the front sight of the gun was used as the bayonet-stud for angular bayonets. Bayonets were more of a psychological weapon than a practical one. A company of infantry charging with polished bayonets created quite a site. However, the problem with the bayonets is that if you were to stab someone with it, the gristle of the person you had stabbed would close in around the bayonet, making it difficult to remove. Therefore, many bayonets were put to other uses such as tent pegs, pot hooks, candlesticks, skewers, and entrenching tools. (Right) James Ewell Brown (JEB) Stuart (1833-1864). 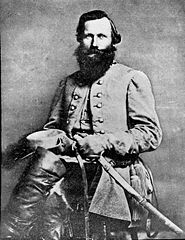 Confederate general J.E.B. Stuart with his 1860 sabre. It was shorter, lighter and less curved than the 1840 model. In his acclaimed Regimental Losses, Fox indicates that of the approximately 250,000 wounded treated in Union hospitals during the war only 922 were the victims of sabers or bayonets. "And a large proportion of these originated in private quarrels, or were inflicted by camp guards in the discharge of their duty." A few instances Of Bayonet Attacks were recorded. 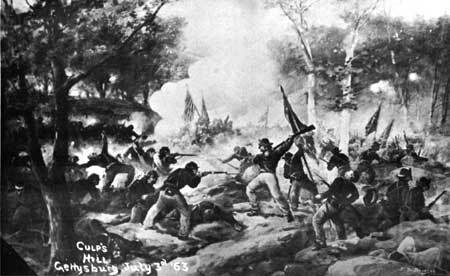 Among the few recorded instances are the charge of the 17th Wisc. at Corinth, Miss., 3 Oct. '62, routing a Mississippi brigade; and the night bayonet attack of the 6th Me. and 5th Wisc. at Rappahonnock Bridge and Kelly's Ford, Va. 7 Nov. '63. Sabers, which are cavalry swords, are a legitimate weapon of the mounted service and dangerous in the hands of a trained trooper. The volunteer horsemen, however, had trouble learning to handle them. There were a good many lop-eared horses in the early months of the war. Gigantic "wrist breakers" with 42-inch scimitar-type blades were soon cut down to 36 inches and were reasonably effective. (Left) Sword reputedly worn by William Barksdale at Gettysburg. Confederate Brig. Gen. Barksdale, while leading an assault against Union forces in the vicinity of Cemetery Ridge on July 2, was wounded in his left knee, followed by a cannonball to his left foot, and finally was hit by another bullet to his chest, knocking him off his horse. He told his aide, W.R. Boyd, "I am killed! Tell my wife and children that I died fighting at my post." Although his troops were forced to leave him for dead on the field, he died the next morning in a Union field hospital. The former U.S. congressman turned Confederate general had died at age 41. Courtesy Mississippi Department of Archives and History. Swords until recent years in America were the symbol of an officer's authority, and served this primary function in the Civil War. The short artillery sword with which the gunners were supposed to disembowel the horse that had overrun their position and then dispatch the rider--was among the most useless of weapons, according to some of the war's combatants. 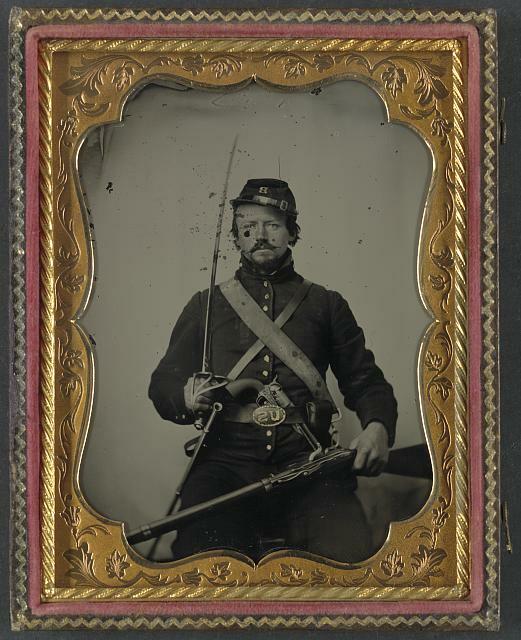 See also Photographic History of Civil War Cavalry Weapons. The lance, another serious weapon in the hands of a trained trooper, also appeared in the war. The 6th Pa. Cav., "Rush's Lancers," was armed with this weapon, in addition to its pistols and a few carbines, until May '63. The weapons shortage in the South led its leaders to give serious consideration to arming troops with lances and pikes. In early 1862 a set of resolutions provided for 20 regiments of Southern pikemen, and on 10 Apr. '62 an act was passed that two companies in each regiment be armed with pikes. "Strangely enough, such foolishness met with the complete approval of the military leaders, and even Gen. Lee on April 9, 1862, wrote Col. Gorgas (Chief of Confederate Ordnance), 'One thousand pikes should be sent to Gen. Jackson if practicable". Georgia's gov. spurred the Production of weapons that are now known as "JOE BROWN'S PIKES." Many different military blades, from Bowie knives to Arkansas Toothpicks, were popular among Confederate soldiers early in the conflict. Soon, however, the impractical sharp weapons were discarded and replaced with additional revolvers. Widely employed swords, sabers, and knives during the Civil War, included: Model 1832 Foot Artillery Sword, Model 1832 Dragoon Saber, Model 1840 Light Artillery Saber, Model 1840 Army Noncommissioned Officers’ Sword, Model 1840 Cavalry Saber, Model 1860 Light Cavalry Saber, M1860 Cutlass, Model 1850 Army Staff & Field Officers’ Sword, the Mameluke sword as well as the Bowie knife. 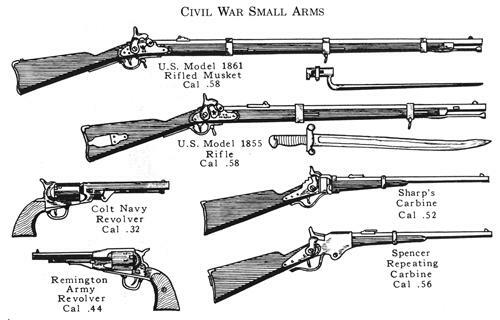 See also: Civil War Cavalry and Infantry Weapons: A Photographic History of Small Arms. The Union Army classified its artillery into three types, depending on the gun's weight and intended use. Field artillery were light pieces that often traveled with the armies, while siege and garrison artillery were heavy pieces that could be used either in attacking or defending fortified places. Seacoast artillery were the heaviest pieces and were intended to be used in permanent fortifications along the seaboard and were primarily designed to fire on attacking warships. The distinctions, however, are arbitrary, because field, siege and garrison, and seacoast artillery were all used in various attacks and defenses of fortifications. See also Civil War Artillery Weapons and Characteristics: A History and Civil War Artillery. 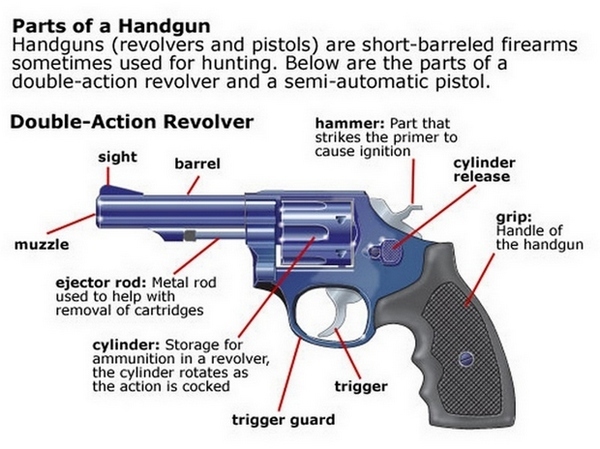 All firearms larger than small arms are known as artillery or cannon. Although there were dozens of different types of cannon used during the Civil War, they all fell into one of two categories: smoothbore or rifled cannon. They were further designated by the weight of their projectile (12-pounder, 24-pounder, 32-pounder, etc. ), the caliber or size of their bore diameter (3-inch, 8-inch, 10-inch), method of loading (breech or muzzle), and often their inventor or the factory in which they were made (i.e. Dahlgren, Napoleon, Rodman, Parrott, Whitworth). A further distinction involved the path of their trajectories: guns had a flat trajectory, mortars a high, arching path, and a howitzer a trajectory between the other two. Civil War artillery was also classified according to its tactical deployment, including field, seacoast, and siege artillery. Cannon were made of steel, bronze, or iron, depending on the availability of material. (Right) Seacoast artillery were the heaviest pieces and were intended to be used in permanent fortifications along the seaboard. The favorite artillery piece in both the Union and the Confederacy was the Napoleon, a smoothbore, muzzle-loading, 12-pounder "gun-howitzer." Developed under the auspices of Louis Napoleon of France, it first appeared in the American artillery in 1857. Relatively light and portable, the Napoleon was used as both an offensive and defensive weapon by both armies. Initially made of bronze, Napoleons were cast from iron when the South ran short of the other metal. Its maximum effective range was about 1700 yards, but it was most effective at about 250 yards or less. Firing canister (see below), the Napoleon probably inflicted more casualties than all other artillery pieces combined. The most used rifled guns were the 3-inch Ordnance and 10-pdr Parrott rifles. These cannon were more accurate and had a longer range - up to about 2,300 yards - than their smoothbore counterparts. During most battles, however, the longer range was unnecessary and relatively ineffective. During this period, a gunner had to see his target in order to shoot with any accuracy, and the shorter range Napoleons were adequate for that purpose. However, rifled cannon were particularly effective in knocking down fortifications and played decisive roles at Vicksburg and Atlanta. Almost all Civil War cannon were muzzleloading; breech-loading models, such as the British 12-pounder rifled Armstrong and Whitworth cannon, were generally unreliable and awkward. The 12-pound mountain howitzers were among the smallest and most portable artillery and were useful in battles fought in the mountainous regions of the Western theater. Naval and siege cannons, including Dahlgrens and Rodman smoothbores, were among the heaviest and most powerful. The 8- and 10-inch siege howitzers had ranges of over 2,000 yards and could fire 45- and 90-pound shells. Artillery ammunition included solid shot, grape, canister, shell, and chain shot, each of which came in any of the nine common artillery calibers. Solid shot and shell were used against long-range, fixed targets such as fortifications; chain shot, consisting of two balls connected by a chain, was used primarily against masts and rigging of ships. Very frequently used was canister; which, like its larger cousin, "grape shot," was a scattershot projectile consisting of small iron balls encased in a container. Canister projectiles came packed in a tin can while grape shot was usually wrapped in a cloth or canvas covering and tied with string which made it look like a bunch of grapes. When fired, the can or wrapping disintegrated, releasing the shot in a spray. In effect, then, a gun loaded with grape shot or canister acted like a large, sawed-off shotgun; it was particularly lethal when fired at a range of 250 yards or less. Grape was less often used by the field artilleries of the day as it was more effective to fire the smaller and more numerous canister balls at an advancing enemy. Thanks to its superior industrial strength, the North had an overall advantage over the South in all types of artillery, as well as a higher percentage of rifled cannon to smoothbore cannon. See also American Civil War Artillery Organization. A variety of weapons was carried at Gettysburg. Revolvers, swords, and bayonets were abundant, but the basic infantry weapon of both armies was a muzzle-loading rifle musket about 4.7 feet long, weighing approximately 9 pounds. They came in many models, but the most common and popular were the Springfield and the English-made Enfield. They were hard hitting, deadly weapons, very accurate at a range of 200 yards and effective at 1,000 yards. With black powder, ignited by percussion caps, they fired "Minie Balls"—hollow-based lead slugs half an inch in diameter and an inch long. A good soldier could load and fire his rifle three times a minute, but in the confusion of battle the rate of fire was probably slower. There were also some breech-loading small arms at Gettysburg. Union cavalrymen carried Sharps and Burnside single-shot carbines and a few infantry units carried Sharps rifles. Spencer repeating rifles were used in limited quantity by Union cavalry on July 3 and by a few Union infantry. In the total picture of the battle, the use of these efficient weapons was actually quite small. Those who fought at Gettysburg with rifles and carbines were supported by nearly 630 cannon—360 Union and 270 Confederate. About half of these were rifled iron pieces, all but four of the others were smoothbore bronze guns. The same types of cannon were used by both armies. Almost all of the bronze pieces were 12 pounders, either howitzers or "Napoleons." They could hurl a 12-pound iron ball nearly a mile and were deadly at short ranges, particularly when firing canister. Other bronze cannon included 24 pounder howitzers and 6 pounder guns. All types are represented in the park today, coated with patina instead of being polished as they were when in use. Most of the iron rifled pieces at Gettysburg had a 3-inch bore and fired a projectile which weighed about 10 pounds. There were two types of these—3-inch ordnance rifles and 10 pounder Parrotts. It is easy to tell them apart for the Parrott has a reinforcing jacket around its breech, The effective range of these guns was somewhat in excess of a mile, limited in part because direct fire was used and the visibility of gunners was restricted. Two other types of rifled guns were used at Gettysburg—four bronze James guns and two Whitworth rifles. The Whitworths were unique because they were breech loading and were reported to have had exceptional range and accuracy. However, their effect at Gettysburg must have been small for one was out of action much of the time. These artillery pieces used three types of ammunition. All cannon could fire solid projectiles or shot. They also hurled fused, hollow shells which contained black powder and sometimes held lead balls or shrapnel. Canister consisted of cans filled with iron or lead balls. These cans burst apart on firing, converting the cannon into an oversized shotgun. Weapons influenced tactics. At Gettysburg a regiment formed for battle, fought, and moved in a two rank line, its men shoulder to shoulder, the file closets in the rear. Since the average strength of regiments here was only 350 officers and men, the length of a regiment's line was a little over 100 yards. Such a formation brought the regiment's slow-firing rifles together under the control of the regimental commander, enabling him to deliver a maximum of fire power at a given target. The formation's shallowness had a two-fold purpose, it permitted all ranks to fire, and it presented a target of minimum depth to the enemy's fire. Four or five regiments were grouped into a brigade, two to five brigades formed a division. When formed for the attack, a brigade moved forward in a single or double line of regiments until it came within effective range of the enemy line. Then both parties blazed away, attempting to gain the enemy's flank if feasible, until one side or the other was forced to retire. Confederate attacking forces were generally formed with an attacking line in front and a supporting line behind. Federal brigades in the defense also were formed with supporting troops in a rear line when possible. Breastworks were erected if time permitted, but troops were handicapped in this work because entrenching tools were in short supply. Like their infantry comrades, cavalrymen also fought on foot, using their horses as means of transportation. However, mounted charges were also made in the classic fashion, particularly in the great cavalry battle on July 3. Cavalry and infantry were closely supported by artillery. Batteries of from four to six guns occupied the crests of ridges and hills from which a field of fire could be obtained. They were usually placed in the forward lines, protected by supporting infantry regiments posted on their flanks or in their rear. Limbers containing their ammunition were nearby. Because gunners had to see their targets, artillery positions sheltered from the enemy's view were still in the future. The deadly effectiveness of the rifle-musket loaded with a minié bullet was largely to blame for the Civil War’s appalling casualty rates. 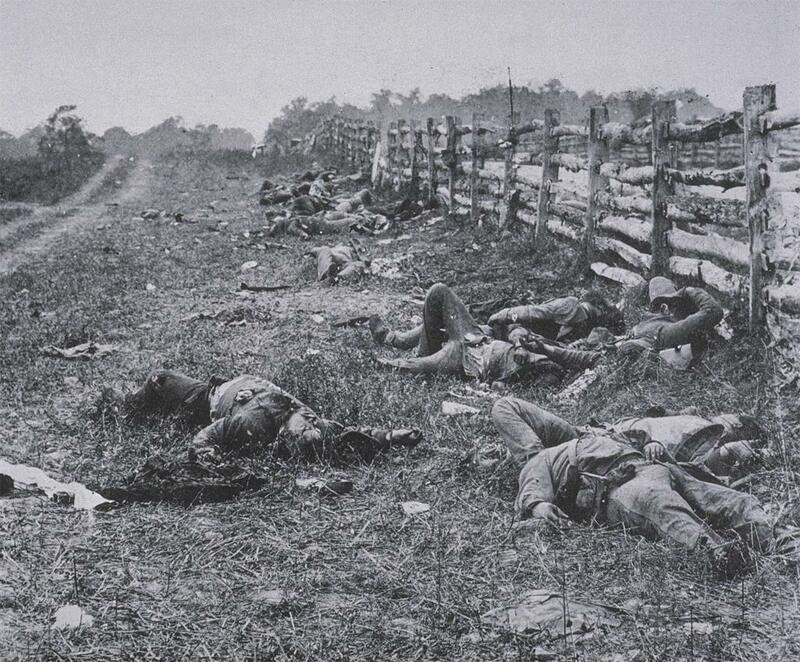 During the nearly 10,500 skirmishes and battles of the war, more than 110,000 Union soldiers and 94,000 Confederates were killed, and an additional 275,000 and 194,000, respectively, were wounded. Rifle bullets, primarily the minié bullet, caused 90 percent of all these casualties. Artillery projectiles accounted for less than 9 percent, and swords and bayonets, less than 1 percent. Considering all this evidence, it is fair to conclude that the rifle-musket and minié bullet greatly affected the overall course of the Civil War and foreshadowed 20th-century warfare. The equations and formulas of warfare had been changed completely, mostly by a simple firearm and bullet: the rifle-musket and Minié ball. The Civil War rifled musket, with its greater accuracy and longer range, was able to kill at a distance of over a half-mile, making a direct, frontal assault a particularly deadly affair. While trained soldiers armed with more accurate, greater distance, faster-firing rifled muskets were able to fire at a rate of three aimed shots per minute while maintaining accuracy up to 500 yards, Napoleonic Tactics, which had used the smoothbore musket at less than 100 yards, were maintained thus producing catastrophic casualties. 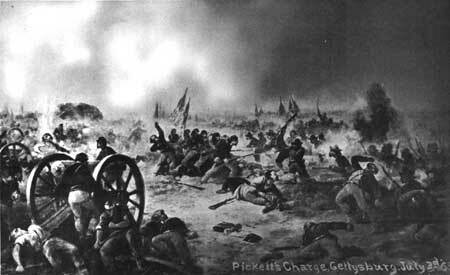 Pickett's Charge included approximately 12,500 men in nine infantry brigades and it was textbook Napoleonic. While Pickett's division had advanced over open fields for three quarters of a mile and headlong into heavy Union artillery and rifle fire, the division had been decimated, with more than 50% casualties, in less than an hour. High casualties were the direct result of Napoleonic Tactics being applied throughout the four year Civil War. With modern weapons employed on the battlefield, Union and Confederate generals, battle after battle and year after year, failed to adapt their battlefield tactics, only to agonize over the massive attrition and decimation that the outdated tactics had caused in their ranks. While the stated tactics were the principal cause of the high casualties, disease can primarily be traced to the wounded soldiers who had marched to the beat of the ancient tactics. With failure to adapt, the conflict claimed approximately 620,000 Americans, which was more than all previous U.S. wars combined. For each soldier killed or mortally wounded, two additional soldiers succumbed to disease. Battlefield wounds often led to amputations, causing Gangrene to become the leading cause of death by disease. See also Civil War Weapons: Hand Grenades, Torpedoes, Mines, and Booby Traps. (Left) Alfred A. Stratton, an American Civil War veteran and double amputee. Although one in thirteen Civil War soldiers became an amputee, the primary cause was the firearm or small arm. (Right) Private Columbus Rush, Company C, 21st Georgia, age 22, was wounded during the assault on Fort Stedman, Virginia, on March 25, 1865 by a shell fragment that fractured both the right leg below the knee and the left kneecap. Both limbs were amputated above the knees on the same day. He recovered quickly and was discharged from Lincoln Hospital in Washington on Aug. 2, 1865. In 1866, while being treated at St. Luke's Hospital in New York City, he was outfitted with artificial limbs. The below data indicates the losses in killed, wounded, and missing in action, where the total was five hundred or more on the side of the Union Troops. Confederate losses given are generally based on best estimates. See also Ten Costliest Battles of the American Civil War (killed, wounded, missing, and captured). Sources: National Archives; National Park Service; United States Army Staff Ride Guidebook; Library of Congress; Official Records of the Union and Confederate Armies; Civil War Society: Encyclopedia of the Civil War; Boatner, Mark M. Civil War Dictionary; United States Army Center of Military History; Earl J. Coates and Dean S. Thomas, An Introduction to Civil War Small Arms; Ian V. Hogg, Weapons of the Civil War; Myatt, Frederick (1994). The Illustrated Encyclopedia of 19th Century Firearms: An Illustrated History of the Development of the World's Military Firearms During the 19th Century. Crescent Books. ISBN 0-517-27786-7; Ricketts, Howard (1964). Firearms. Weidenfeld and Nicolson; Russ A. Pritchard, Jr. Civil War Weapons and Equipment. Globe Pequot, 2003; Brent Nosworthy (2003). The Bloody Crucible of Courage, Fighting Methods and Combat Experience of the Civil War. Carroll and Graf Publishers. ISBN 0-7867-1147-7; Longacre, Edward G. Lincoln's Cavalrymen: A History of the Mounted Forces of the Army of the Potomac. Mechanicsburg, PA: Stackpole Books, 2000. ISBN 0-8117-1049-1; Gettysburg National Military Park; William H. Price, The Civil War Centennial Handbook; National Museum of Health and Medicine; U.S. National Library of Medicine.